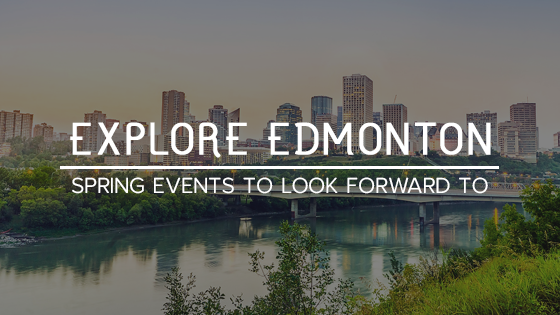 Whether you’re new to the city or simply looking for something to do with your family, Edmonton certainly has plenty of events to offer. Throughout the year, Edmonton (and its surrounding area) plays host to some rather fantastic and enjoyable activities. Spring tends to be quieter than summer or winter, but that doesn’t mean there’s a lack of events happening. Here are five suggestions that you and your family may enjoy! What’s better than enjoying the fresh air and supporting a good cause? In support of women and girls in developing countries, Walk in Her Shoes aims to raise funds to help break the cycle of poverty. Each year, individuals who participate in the event are encouraged to walk 10,000 steps. This number is the average amount of steps that women and girls in developing countries walk every day to collect water, food and firewood for their families. The whole family is encouraged to come down and walk! Not only will you be surrounded by people working for the same cause, but there will also be prizes, fun activities, and much more for everyone to enjoy. If you haven’t stopped by the Art Gallery of Alberta, maybe this will convince you! Throughout every month of the year, the AGA provides the public with several activities such as yoga, landscaping, painting classes, and weekly classes for toddlers. Occasionally, the Gallery teams up with individual groups of people to create specialized events. On April 9, the AGA is hosting SWARM: April, where the night has been designed for teens by teens. Throughout the night, teenagers will have the opportunity to meet an artist, create art, and make new friends! Sometimes you want the answers to whether something is fact or fiction. Well, the MythBusters have done just that. Whether it’s a popular belief or an Internet rumour, they’ve tested and deduced whether these myths are “busted,” “plausible,” or “confirmed.” And now, they’re coming to Edmonton! Or, rather, their experiments are. You and your family will have the opportunity to see over 60 artifacts from experiments conducted on the show, handpicked by the MythBusters. The exhibition isn’t just for the kids. As for the adults in attendance, you’ll be able to participate in hands-on activities as well. Every year, usually on Mother’s Day, the breathtaking ice show Stars on Ice comes to Edmonton. If your family fell in love with figure skating (or Tessa Virtue and Scott Moir) like the rest of the world did during last year’s Olympics, then this is a show you won’t want to miss. The show began in 1986, founded by Scott Hamilton (1984 Olympic Gold Medalist), who brought it to Canada in 1990. Stars on Ice is a theatrical production that features a small cast of figure skaters, who perform with each other as an ensemble and in solo programs. Last year, the show was focussed on the Olympic figure skating team, including Patrick Chan, Kaetlyn Osmond, Meagan Duhamel and Eric Radford, and several others. Venture out of the city into St. Albert and enjoy the Rainmaker Rodeo. Every year, the St. Albert Kinsmen Club hosts plenty of cowboys and cowgirls for a weekend of fun! Bring the family down, cheer on the riders, and enjoy the atmosphere. The rodeo isn’t just about barrel racing or calf roping, as local vendors come out to share their wares. From hand-crafted jewellery to delicious food trucks, you’ll have several choices of where you can spend your time. Those are just a few suggestions of where you can spend time with your family this spring. If you know of any other events that you want to share, feel free to leave a comment on Facebook!